1. Participants are students of Junior High School (SMP/MTs). 2. 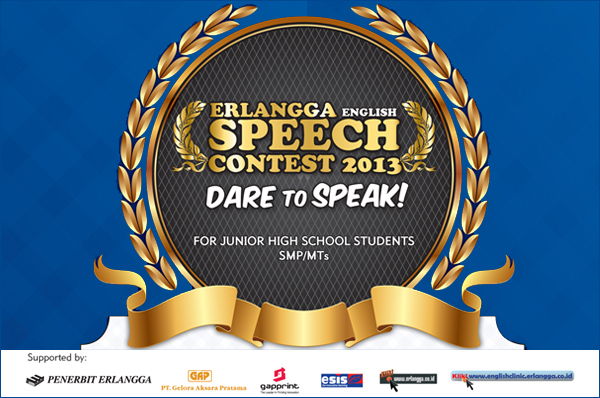 Participants have to complete the registration form and send it back to the committee of Erlangga English Speech Contest 2013. 3. Participants can visit www.erlangga.co.id to download the registration form or to fill out the online registration. 4. Adjudicators’ decision is final. 5. Participants are ready to deliver their speech at Penerbit Erlangga branch office for the preliminary (choose one topic). 6. No registration fee is required. 7. Registration will be closed on 30 September 2013. 8. This contest is only open for non-native English Speaking Participants.